There. I said it, and I do think it is. I see how this goes against the planned Valentine's Day strictly lovey-dovey posts, but this is one love story I certainly did NOT like. Finding out Snape's 'big secret' was probably the worst part of reading the Deathly Hallows for me. Well, until the movie came out and I was made to watch the incredible Alan Rickman actually cry like a baby. Quick question Rowling, why did you have turn such an amazing, complex character into a soppy teenager? WHY!? Let me take you back seven Hogwarts years. 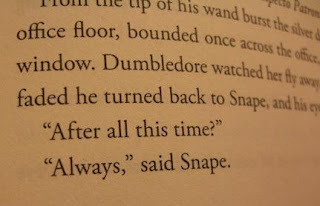 I loved Snape from the moment he was introduced, you know, ever since when Harry saw him in the Great Hall and his scar hurt. The malicious, badass Slytherin professor who does everything in his capacity to make Harry's life miserable, and in spite of being described as greasy-haired and icky, is portrayed by Alan Rickman. What's not to like? Actually, it's not the part where he turns out to be on Dumbledore's side that bothers me. That's one 'twist' we all sort of expected; I mean, you didn't really think he fooled Dumbledore, did you? I wish it wasn't because of love though, because a mushy love story just doesn't fit in with such a badass character. It's funny how Snape suddenly goes from 'an adult who bullied you, not to mention all your friends, for seven years' to 'a great man you ought to name your kids after'! And all because he had a crush he couldn't quite get over. Sure, he loved Lily. I bet Lucius loved Narcissa; doesn't make either of them saints. Did everyone who read 'The Prince's Tale' not read 'Snape's Worst Memory'? When James Potter was a troublemaker, Snape was a budding Death Eater. Did he not care about Lily when he turned into one? And when he told Voldemort about the prophecy? When he asked Voldemort to spare Lily and just kill her child? And in Hogwarts, after supposedly turning super-good, it wasn't just Harry, whom he bullied. Snape tortured every person he set his eyes on who wasn't a Slytherin. Great Post. Whats with all the anti-HP posts lately though? Don't be such a hater! Oh not all! Just three... I still do love Harry Potter, by the way! Yeah and you know whats the worst thing was in the book? Harry naming his son after Snape... it had me laughing at the end. Offense? None taken, Harry Potter is one of my favourite books ever. I love it, just not this particularly hyped sub-plot! I found not just Prince Tale over rated but whole Deathly hallows as over rated. BTW You've been tagged, check my blog :) Really hoping you'll carry it forward. I disagree with you on that; it was my second favourite book of the series, preceded by The Prisoner of Azkaban. I could say the books are better than the movies, but I guess to each his own! I don't really do tags, but this one actually sounds good. I might do it. Anyway, thanks for tagging me!